Soviet space dog Malyshka being prepared on a centrifuge for a space flight. 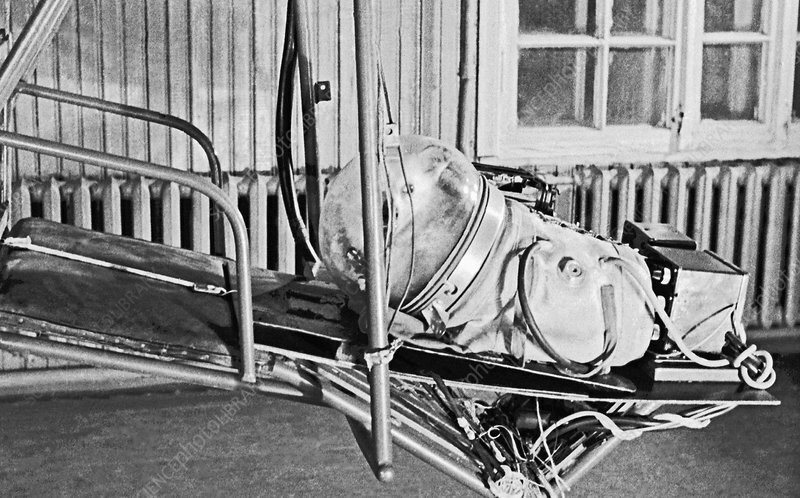 During the 1950s and 1960s, numerous suborbital and orbital spaceflights involving dogs were launched by the Soviet Union. All the dogs were female strays. Malyshka ('Little One') flew on three suborbital spaceflights, and returned safely each time. The flights took place on 19 August 1951, 4 November 1955 and 31 May 1956. Preparations and training included wearing space suits, being confined to small spaces for long periods of time, and use of simulators that reproduced conditions during a rocket launch. Photographed in Russia in the 1950s.